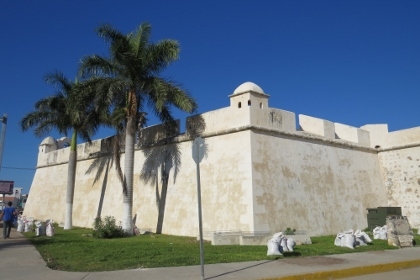 The Historic Fortified Town of Campeche retains many of the old colonial Spanish city walls and fortifications which protected the city (not always successfully) from pirates and buccaneers. Campeche was founded in 1540 by Spanish conquistadores as San Francisco de Campeche atop the pre-existing Maya city of Canpech or Kimpech. Originally, the Spaniards lived inside the walled city, while the natives lived in the surrounding barrios of San Francisco, Guadalupe and San Román. These barrios still retain their original churches. 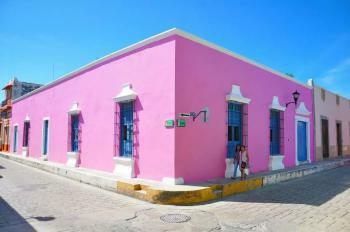 Campeche isn’t much more than a pretty face, polished up for tourism. Together with Queretaro that I visited earlier this trip, I would nominate it rightaway for deletion from the list. 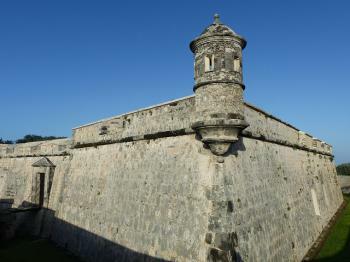 Already when reading the AB evaluation and the meagre nomination document, it becomes clear that this is a site among many – one of 2 preserved fortified Spanish ports in Mexico, and well then there’s Havana and Coro and San Juan and Portobelo and…. 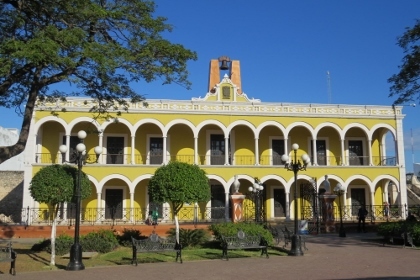 The historical area occupies only a small part of the modern city of Campeche. I had some trouble finding it, including my hotel which was located in the core zone (but had parking on site!). When you’re near you’ll be driving through narrow streets where a steady row of cars tries to get through and another row is parked by one side of the road. Driving in circles is made more pleasurable here by the pastel colours of the buildings that lighten up in the sunshine. Also noteworthy is how low some streets lie, and how high the pavements are. It’s like driving through a gutter. I spent an afternoon, night and early morning in Campeche. I walked around town twice. The city “feels” very Cuban, although a more capitalist version as each and everyone of these pink/orange/baby blue houses is now occupied by either a shoe shop or a clothing store. And everyone has to get everywhere by car, it's not relaxed being a pedestrian. In an hour or so you’ve seen it all and walked along the city wall plus each of the forts which are no match for the formidable ones around Havana. The walls of Campeche are nice but not complete and Not all original. I cannot imagine that there were not several similar or even more impressive even in the new world. For European standards they are modest. I either don't know enough to say if the colourful houses of the old city are unique and if there OUV is justified. However, to wander through the streets is a delight. Many houses are nicely renovated and the streets are full of shops, bars, restaurants and galleries. When you enter you see that the rooms are often beautifully and simply renovated. High ceilings with parallel how you can still find it in the buildings of Barragán and other modern architects. In some places the rooms extend in long sequences far into the building, sometimes combined with courtyards and fountains. I got there after a day excursion to Uxmal, enjoyed my evening there and would have liked to stay for two days to explore the city with leisure. There are two original forts that I missed with interesting museums and at least one more worthwhile museum in town. Less then an hour away is the great precolumbian site of Edzna. Campeche is a colonial town, set on the cost of Yucatan, that has retained most of its original defensive fortifications. Even if a small part of the wall itself remain, all bastions (or forts) are still in place and give a clear and vivid idea of the initial aspect of the town when the fortifications were raised to prevent attacks from pirates. Moreover, the colourful houses, the quadratic town plan and the colonial churches bring additional interest to this WHS. On the main square, there is a WHS board commemorating the jubilee of the inscription of the town to the WH list. However, if you go towards the sea on the road being on the cathedral side, you will end up of the Plaza del Patrimonio Mundial (World Heritage square) on which you can find the original official WH board as well as another board with all Mexican sites until 2002. I visited this WHS in December 2015. 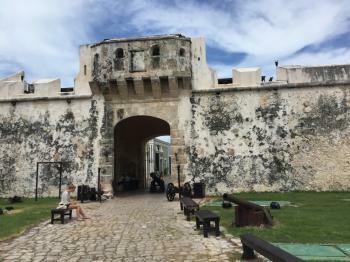 It is a good example of a fortified colonial town in the Carribean as much of the walls, bulwarks, bastions, ramparts are intact and the historic centre has not yet become a museum. The colourful houses go well with most of the tourists who are not thrilled by the fortifications and the bastions house interesting museums inside. The most noteworthy is definitely the one on Mayan Archaeology which has quite a remarkable collection of jade masks from Calakmul. 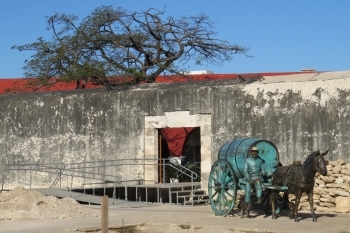 The restoration of the bastions of San Carlos (in Els's picture) is a clear example of over-restoration in my opinion and therefore I'd recommend Fort San Miguel which is just a short distance by car, out of the historic centre and overlooking the Gulf of Mexico (pictured here). The catedral has just been restored too and worth a visit. In the middle of the square garden, just watch out for the UNESCO plaque which strangely enough has been placed on the floor (so you might be stepping on it without knowing, as I did the first time I visited!). I enjoyed my time here and although it is not one of the best WHS on the list, it was a pleasant break from the Mayan WHS I was visiting in Mexico and Guatemala. Campeche was the first true World Heritage Site listed Spanish colonial town I have seen in Mexico and in my life, as the result, I really had a good time in Campeche for its colourful houses and interesting designed churches. From early morning I drove from Chichen Itza and arrived to Campeche around 11 AM, the city of Campeche was really quiet and laid back, hard to believe its status of state capital city. I parked my car in the car park in front of the town wall. The wall was not impressive or beautiful, so I was a bit disappointed. But when I entered into the inner town, countless rows of colourful houses were pretty lovely to see. I really liked that no next buildings painted in the same colours, so the whole town was like a candy town with door and window portals painted in white likes icing cake. Most of the buildings have only one floor, so Campeche was quite less urban. I tried to see the interior of some building, but most of them were really plain with no decoration at all. I walked around the town and really admitted that this town even it was really photogenic, there was nothing much to see actually. A lot of cars also parked along the streets, sometimes good for photo, but most of the time ruined the view. Then I went to the town main square, the cathedral was under renovation and closed. Then I decided to have lunch and went to try Pan de Cazón, a local specialty of tortilla and minced shark meat at lovely Marganzo Restaurant. I finished my time in Campeche by drinking Hochata de coco and a glass of margarita before continued my trip to Uxmal. 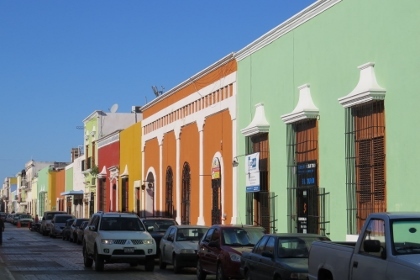 In my opinion Campeche is a lovely place to see for couple of hours, the town do not have any architectural wonder or masterpiece to be a highlight of my visit. But the town has its own charm especially for its colourful buildings. I wondered if I have seen more Spanish colonial towns before, my idea on this town maybe different, but since Campeche is my first experience on this kind of style, this town will always have a special place in my memory. Lighthouses: Ex-Templo de San José: a lighthouse, complete with weather vane, atop the right spire. 108 Community Members have visited.